People think they are free when they are happy in their paradise, however, they are more confined. A perfect society in this world exists. This world only exists inside each individual's mind since there are different definitions for what creates a perfect world. However, one similar quality within everyone's little world is how to maintain its perfect status and how to keep power over it. Although complete perfection is impossible to fulfill, it does not stop people from striving towards it. 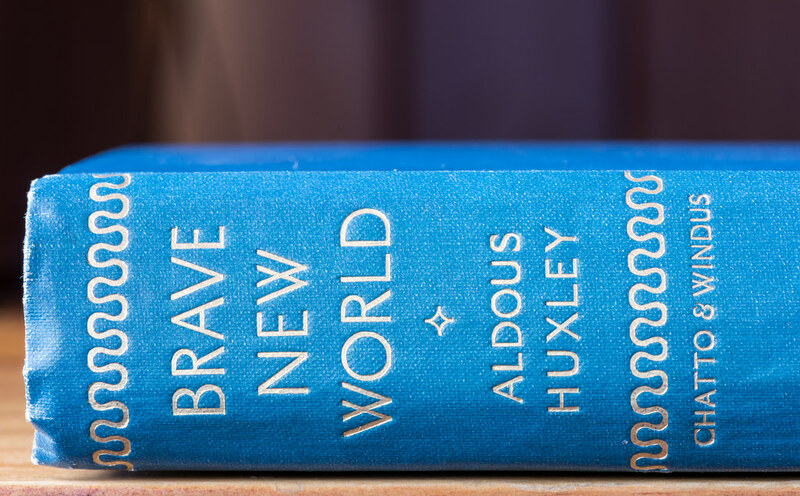 An example of a compelling utopian story is narrated by Aldous Huxley in "Brave New World," which shows how a few inconspicuous factors of power, such as burying a whole world's past and suppressing undesirable human emotions, can play an extreme role on the journey to their perfect utopian world. Mustapha Mond chose to continue the perfect storybook created by previous World Controllers. As a hero of this world, he continues to bury the history of the "old world" in order to "protect" his world from the old ideologies that create unhappiness and ultimately lead to an imbalanced, chaotic society. He takes a major stride towards his own idea of perfection because if he hides the past, he rewrites what people should value and therefore, dictates how the society will run. On the other hand, John's ideal world is on its own. In order to maintain control and keep his values, he whips himself for self-discipline. For instance, the exposure of historic texts from Shakespeare leads John to dive into a deeper understanding of humanitarian values, causing him to crave the miseries in life. He strives for the old ideology that suffering must be endured in order to truly appreciate the values of passion and happiness. However, Mustapha Mond and previous World Controllers, in order to preserve their status and power, designed the society to where once one is exposed to the humanitarian values of the past, they would be alone in achieving those ideologies. Unfortunately enough, John's ideal world shatters as he ironically lives through his own Shakespearean tragedy, which is only a small story within Mustapha Mond's book. He embodied everything that the society was warned against, "mother, monogamy, [and] romance" and felt too strongly on his own, eventually driving himself to his end. By concealing the people's history, a crucial part of their identity is lost. Because everyone is in uniform with what is imprinted in their minds, their community influences them to believe what is being taught about their present world, they will eventually hold them as personal values and look upon the old world with aversion. Therefore, once exposed to the knowledge of the past, it becomes extremely difficult to live within a society that holds a completely different set of values. The deeper one dives within the past, the more isolated and insane they will become, feeding into Mustapha Mond's flawless story. In the end, Mustapha Mond not only buries their history, but he also buries the people who dare to seek out the past so no one is able to grasp that power. Thus, proving that exposure to history is too dangerous for those other than the World Controller himself, the one with the most knowledge, the author of all their stories, and therefore, the one who will always prevail to the top. Power is within emotions. People suffer when experiencing negative emotions, which eventually incites conflict even on a large scale: war, disease, and death. So by eliminating part of their humanity and their freedom to feel all natural emotions, people will no longer be able to pose a threat within Mustapha Mond's "Brave New World." The people within this society are given the opportunity to escape from their issues to a paradise that lies with soma. Although it cuts the time of living, the controllers claim that the ideal life is more time being happy and less time to lose suffering in a prolonged life without soma, in other words, the happy quality of life makes it seem longer than a prolonged time of living that includes suffering. Because it is so easily accessible, people become addicted to the happiness that comes from the other side of the pill. John sees how enslaved everyone is by soma once his mother passes away and says, "Don't you want to be free...?" There is no point in being dissatisfied, so, therefore, Mustapha Mond has control over them like slaves by luring people into the palms of his hands with soma. The happiness that results from the drug is an illusion of freedom. People think they are free when they are happy in their paradise; however, they are more confined, but by being happy, there is no reason to think otherwise. In fact, by altering the characteristics and qualities within each person in different castes, most people within the society are unable to think of their ideal world and how to feel about specific issues since they have the inability to see them and blindly follow what they are told to do by their predestination. If the source of happiness lies within the hands of the government, people will gravitate towards governmental values in order to obtain it; therefore, by controlling one's emotions, he wins the heart and deceives the mind. Extreme lengths are measured when maintaining power over a perfect society of "COMMUNITY, IDENTITY, [and] STABILITY." Damage upon humanity spreads like an invisible wildfire within "Brave New World" that only the reader can see. Aldous Huxley tells his story with intentional flaws in the perfect world for his audience to understand that what is seen on the outside, the mask, may seem like a utopian society. However, once uncovered and digging is done, he reveals its true colors and presents itself to be a dystopia.